ARA MACAO!! ARA MACAO!! ARA MACAO!! Status: Many of the world's parrots are in danger of extinction largely because people have destroyed much of their habitat. Diet in the wild: Plan fruits, figs, berries and nuts. During the breeding season also insects and their larvae. Diet in the zoo: peanuts, but this is given only for a treat, seeds, and fruits such as orange, banana, coconut. Sometime they are given green pepper, and corn on the cob. Appearance: Has a long red pointed tail, head, and shoulders, yellow and blue wings, and bright blue back. Scarlet Macaw ( Ara Macao ) has a long pointed red tail, head, and shoulders, yellow and blue wings, and bright blue back. They are about 85cm long. These noisy, colorful birds can be found in riverside tropical rain forests. All 18 species of macaws are threatened. They are one of the largest birds in the New World. Now, these wonderful birds are being threatened. There are hardly any more of these species left. In fact, they're listed under one of the endanger species. The primary dangers are habitat loss and heavy exploitation for the pet trade. It is a amazing how some of the macaw live to be 80 years old . They are easily tamed and can be trained to imitate the human voice. Scarlet Macaw is one of many parrots that is very smart. The Scarlet Macaw have proportionately large hooked bills. Their hooked bills resemble those birds of prey. Yet their adaption to eating fruits and seeds is what they are used to. The Scarlet Macaws are wonderful flyers. The Scarlet Macaw at the Ft. Worth Zoo is 20 years old. They are on a basic artificial diet, and they go on a daily routine. The Scarlet Macaw are very intelligent birds. The Macaw has feet with toes that are arranged with two in front and two behind. This type of foot is very helpful in manipulating food. 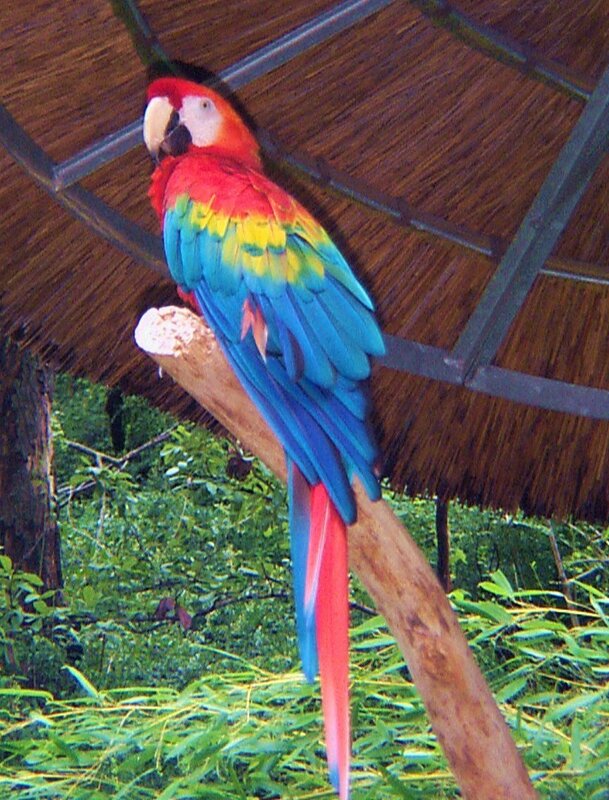 The Macaw's wings at the zoo are clipped and therefore they cannot fly.